Home/Cheerleading, Fitness/Cheerleading… yeah, way tougher than you think! Cheerleading… yeah, way tougher than you think! As a UK cheerleading uniform manufacturer, PINKfudge understands why cheerleading may look just ‘fun and games’ to an outsider. BUT… an athletic discipline combining aerial displays, gymnastics, dance and teamwork in a choreographed 2 minutes 30 second routine, requires both mental and physical strength, determination and huge commitment! Make no bones about it guys, cheerleaders are amongst some of the fittest athletes in the world! Now… being ‘fit’ doesn’t come without hard work. Just like any athletic discipline, preparation for cheerleading competitions is both physically gruelling and mentally draining. So how do these athletes stay on top of their fitness levels, improve and train stamina, jumps, tumbles and stunts? Stick around as we take you through some of the top tips we’ve learnt from our customers over the years, when it comes to that ‘oh so important’ competition prep! The jump section. The most dreaded element of every cheerleader’s routine, those words… “and again” embedded in every cheerleader’s psyche before training ever starts. So how exactly do cheerleaders train this critically tough element and just make it look so darn’ easy? Well… technique. 1.They have to be high. Never sacrifice technique for height and flexibility. To quote the famous French philosopher Voltaire (with great power comes great responsibility) and put into cheerleading terms… “with great technique comes great height and maxed out points”. Performing gymnastic elements on demand, throughout a routine takes years of dedication and hard work and isn’t easy. Whether an athlete has mastered tumbles or has just started… POWER… IS… EVERYTHING. Seriously, power is everything, and with a powerful hurdle start, an athlete can ensure their tumble has speed, strength and precision. How do athletes achieve this important turbo power? The answer… training strength, cardio and endurance! Master all of those and you’re well on our way to becoming a tumbling pro. No short cuts here guys! Here it is again guys…TECHNIQUE! The Duck and Granny refer to the shape of a cheerleader’s back when stunting. A ‘duck’ – when the backside sticks out, forming a curve in their back during stunting prep. A ‘granny’ – The opposite, when the cheerleader hunches forward. Both techniques are wrong, resulting in a 50% loss of strength. The solution? ‘Keep your core strong’, tuck your tail under and squeeze those shoulder blades. A combination I’m sure every cheerleader will tell you is a drilled rule. Seems simple, right? To cut a long story short, cheerleading is not for the faint hearted and If you don’t have the time, energy or commitment then perhaps you’re more suited to bowls! 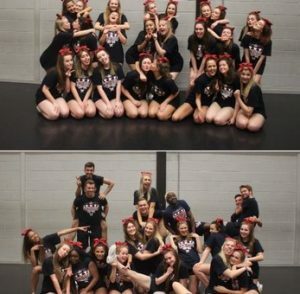 Whether a cheerleading coach, a newbie or part of a cheerleading family PINKfudge have a wonderful range of cheerleading training wear, suited to all shapes and sizes. Simply give us a call on 01245 346255 or email us on sales@pinkfudge.com to have a chat about how our training wear can match the hard work and dedication of those wearing it!